Patients with brain metastases from lung cancer have poor prognoses and short survival time, and they are often excluded from clinical trials. Whole-cranial irradiation is considered to be the standard treatment, but its efficacy is not satisfactory. The purpose of this phase II clinical trial was to evaluate the preliminary efficacy and safety of the treatment of whole-brain irradiation plus three-dimensional conformal boost combined with concurrent topotecan for the patients with brain metastases from lung cancer. Patients with brain metastasis from lung cancer received concurrent chemotherapy and radiotherapy: conventional fractionated whole-brain irradiation, 2 fields/time, 1 fraction/day, 2 Gy/fraction, 5 times/week, and DT 40 Gy/20 fractions; for the patients with ≤ 3 lesions with diameter ≥ 2 cm, a three-dimensional (3-D) conformal localised boost was given to increase the dosage to 56–60 Gy; and during radiotherapy, concurrent chemotherapy with topotecan was given (the chemoradiotherapy group, CRT). The patients with brain metastasis from lung cancer during the same period who received radiotherapy only were selected as the controls (the radiotherapy-alone group, RT). From March 2009 to March 2012, both 38 patients were enrolled into two groups. The median progression-free survival(PFS) time , the 1- and 2-year PFS rates of CRT group and RT group were 6 months, 42.8%, 21.6% and 3 months, 11.6%, 8.7% (χ2 = 6.02, p = 0.014), respectively. The 1- and 2-year intracranial lesion control rates of CRT and RT were 75.9% , 65.2% and 41.6% , 31.2% (χ2 = 3.892, p = 0.049), respectively. The 1- and 2-year overall survival rates (OS) of CRT and RT were 50.8% , 37.9% and 40.4% , 16.5% (χ2 = 1.811, p = 0.178), respectively. The major side effects were myelosuppression and digestive toxicities, but no differences were observed between the two groups. Compared with radiotherapy alone, whole-brain irradiation plus 3-D conformal boost irradiation and concurrent topotecan chemotherapy significantly improved the PFS rate and the intracranial lesion control rate of patients with brain metastases from lung cancer, and no significant increases in side effects were observed. Based on these results, this treatment method is recommended for phase III clinical trial. With the increase in lung cancer incidence year-by-year and prolonged survival, the incidence of brain metastases from lung cancer has also been rising, accounting for approximately 45% of intracranial metastatic carcinoma. The prognosis for patients with brain metastases is extremely poor; the natural disease duration is less than 3 months. Radiation therapy remains the primary treatment for patients with brain metastases. Specifically, whole-brain irradiation alone is the most commonly used method to treat brain metastases from lung cancer[3–5], and it can increase patient survival by up to 3–6 months[6, 7]. However, half of the patients experience local control failure or recurrence[8, 9]. Thus, the local control of brain metastases is a key factor for prolonging patient survival and improving their quality of life. 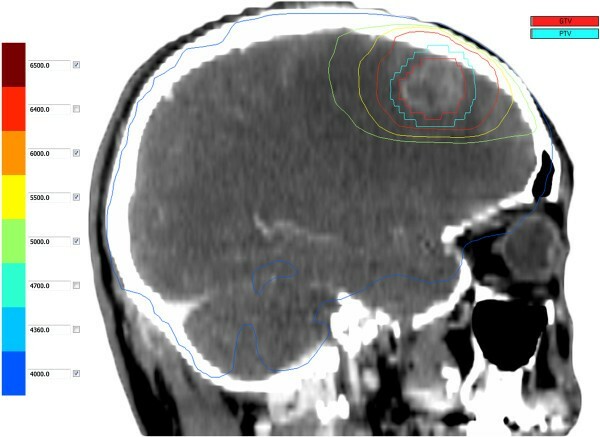 With the increasing application of precise three-dimensional (3-D) conformal radiotherapy, it has been reported that, in the case of large tumours, precise radiotherapy after whole-brain radiotherapy improves the local control rate and effectively alleviates the central nervous system symptoms[10, 11]. Metastasis of lung cancer to the brain indicates an advanced stage of disease. The combination of cranial radiotherapy and systemic chemotherapy should theoretically strengthen local control and reduce tumour metastases, thereby improving survival. Chemotherapy drugs that can pass through the blood–brain barrier and sensitise tumour cells to radiation may effectively treat brain metastases from lung cancer. The semi-synthetic camptothecin derivative topotecan inhibits topoisomerase I and can pass through the blood–brain barrier and exert a radiosensitising effect. It was reported that the combined treatment of topotecan and whole-brain irradiation for patients with brain metastases from lung cancer improved the local control rate of brain metastases and also demonstrated a trend of improvement in survival[14, 15]. To our knowledge, there have been no reports of whole-brain irradiation plus 3-D conformal boost combined with concurrent topotecan chemotherapy. We previously conducted a phase I clinical trial of radiotherapy combined with topotecan for the treatment of brain metastases from lung cancer and determined the maximum tolerated dose. We conducted this phase II clinical trial to further evaluate the safety and efficacy of the combined regimen. The inclusion criteria in this study were as follows: patients with brain metastases from lung cancer which were pathologically or cytologically confirmed; previously untreated patients or patients with brain metastases after treatment for extracranial tumour; the metastasis not in the brainstem based on the cranial MRI examination performed before treatment; 18–70 years old; Karnofsky performance status (KPS) score ≥ 60; normal blood, liver, and kidney tests; no chemotherapy in the previous month; no history of cranial radiotherapy or surgery; and expected survival ≥ 3 months. The exclusion criteria were as follows: pregnant or breast-feeding women, second primary malignancy, severe pulmonary infection, combined psychiatric disorder, or other diseases requiring hospitalisation. All patients provided written informed consent. This study was approved by the Hebei University Ethics Committee, met the standards of human clinical trial, and complied with the provisions of the Declaration of Helsinki in 1975 (including the 2000 Revision). Baseline assessment included taking a detailed medical history, comprehensive physical examination, head magnetic resonance imaging (MRI) scan with contract, chest and abdomen computed tomography (CT) scan, ECT bone scan if clinically suggested, electrocardiogram, and routine blood and comprehensive metabolic panel examinations. All tests were completed two weeks before the treatment. The patients in the concurrent chemoradiotherapy group (CRT group) received whole-brain irradiation with 3-D conformal boost combined with concurrent topotecan chemotherapy. The patients who received the same radiotherapy regimen without concurrent chemotherapy during the same period were selected as the control group (radiotherapy-alone group, RT group). Elekta accelerators (Precise linear accelerator, 6MV-X-ray) were employed in this study. Nucletron Plato Patient Selection system v3.4.0 software was used to optimise radiation treatment planning. Radiotherapy was performed with multi-leaf collimator whole-brain irradiation, 2 fields/time/day, 5 days/week, DT40Gy/20 times. All patients received head MRI scan with contract after the dosage of DT40Gy. For patients with ≤3 intracranial metastases with lesion diameters ≥ 2 cm, CT simulation with contrast was performed. The MRI and CT image fusion was used for target delineation. The gross tumor volume (GTV) was defined as the intracranial residual lesions, and the planning target volume (PTV) was defined as the GTV enlarged by a margin of 3 mm. Irradiation was boost with three-dimensional conformal radiotherapy technology. According to the organs at risk, the total dose for PTV was up to 56–60Gy (as shown in Figure 1). The synthesis scheme demonstrated the final effects of the whole cranial irradiation plus late course boost irradiation to residual lesion. The orange line was 60 Gy to PTV, while the blue line was 40 Gy to the whole cranum. Topotecan was administered at 1.75 mg/m2 by phleboclysis once a week on the first day of radiotherapy and given 4–6 times over 4–6 weeks. One month after radiotherapy was completed, cranial MRI and chest and abdominal CT were performed to evaluate treatment efficacy according to RESICT1.1 standards. Side effects were evaluated according to the Common Terminology Criteria for Adverse Events v3.0 (CTCAE 3.0). All cases were followed up with outpatient or inpatient examinations and telephone interviews. The follow-up was conducted monthly for the first 3 months, then at 6 months, and once every 6 months subsequently. As of August 20, 2012, the follow up rates were 100% for both groups. This was a prospective phase II clinical study to evaluate the preliminary efficacy and safety of the concurrent chemoradiotherapy. The control group received the same radiotherapy regimen without concurrent chemotherapy during the same period of time. SPSS16.0 statistical software (SPSS Inc., Chicago, IL, USA) was used for statistical analyses. The outcome ratios were used for χ2 tests, t-tests or rank-sum tests were applied to compare group means, survival rates and the control rates of intra- and extracranial lesions were calculated using the Kaplan-Meier method, and significance was determined with Log-Rank tests. For all analyses, p < 0.05 was considered statistically significant. The primary endpoint of this study was progression-free survival (PFS), and the secondary endpoints were overall survival (OS), intra- and extracranial lesion control rates, total efficiency, and side effects. From March 2009 to March 2012, 38 patients were prospectively enrolled in CRT group, and 38 patients who received radiotherapy alone during the same period of time were selected as the control group (RT group). Together, the study population included 47 males and 29 females aged from 36 to 70 years old, and the median ages of the concurrent and radiotherapy-alone groups were 59 and 60.5 years old, respectively. The concurrent group included 15 cases of small cell lung cancer (SCLC) and 23 cases of non-small cell lung cancer (NSCLC). The radiotherapy-alone group was comprised of 13 cases of SCLC and 25 cases of NSCLC. In the concurrent and radiotherapy-alone groups, 14 and 16 cases showed concomitant metastases in other organs, respectively. There were no significant differences in clinical data between the two groups (Table 1). In CRT group, 17 patients underwent 3-D conformal boost irradiation. One patient showed a low platelet count after 36-Gy whole-brain irradiation with concurrent chemotherapy for 3 weeks, and chemotherapy was stopped. The remaining patients completed four rounds of concurrent chemotherapy and underwent conformal boost. In RT group, all patients completed the radiotherapy, and 15 patients received conformal boost. In CRT group, 9 cases showed complete response (CR), 24 cases showed partial response (PR), and 5 cases exhibited stable disease (SD), for a total response rate (CR + PR) of 86.84%. In RT group, there were 5 cases of CR, 23 cases of PR, and 10 cases of SD, for a total response rate (CR + PR) of 73.68%. The response rate of CRT group was higher than that of RT group, but the difference was not statistically significant (χ2 = 2.077, p = 0.149). The median PFS time and 1-and 2-year PFS rates in CRT group and RT group were 6 months, 42.8%, 21.6% and 3 months, 11.6%, 8.7% (χ2 = 6.02, p = 0.014), respectively. 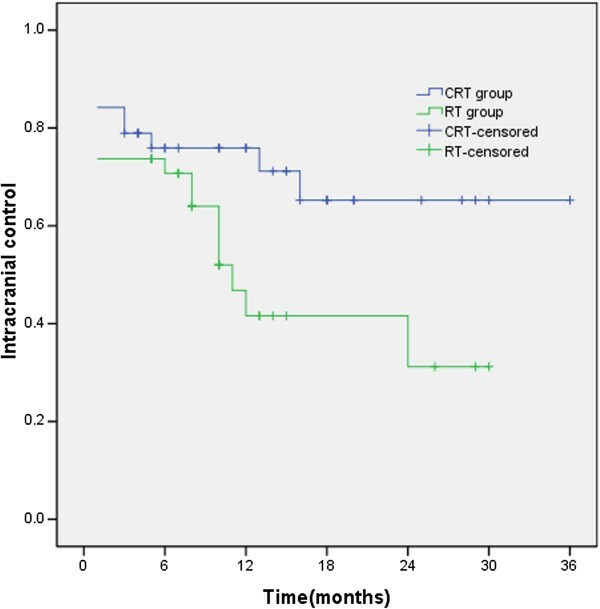 The PFS of CRT group was significantly longer than that of RT group (Figure 2). The median PFS time and 1-and 2-year PFS rates in CRT group and RT group were 6 months, 42.8%, 21.6% and 3 months, 11.6%, 8.7% (χ 2 = 6.02, p = 0.014), respectively. The median survival time (MST), the 1- and 2-year survival rates were 13 months, 50.8% and 37.9% for CRT group and 10 months, 40. 4% and 16.50% for RT group (χ2 = 1.811, p = 0.178), respectively. 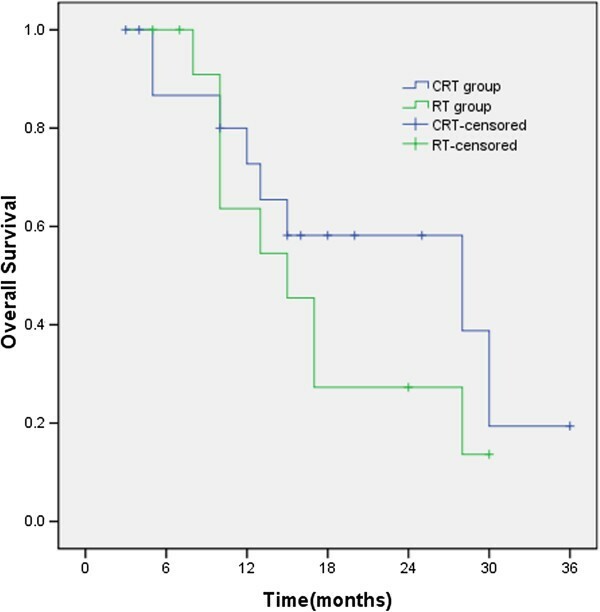 Survival time in CRT group was longer than that in RT group, but the difference was not statistically significant (Figure 3). 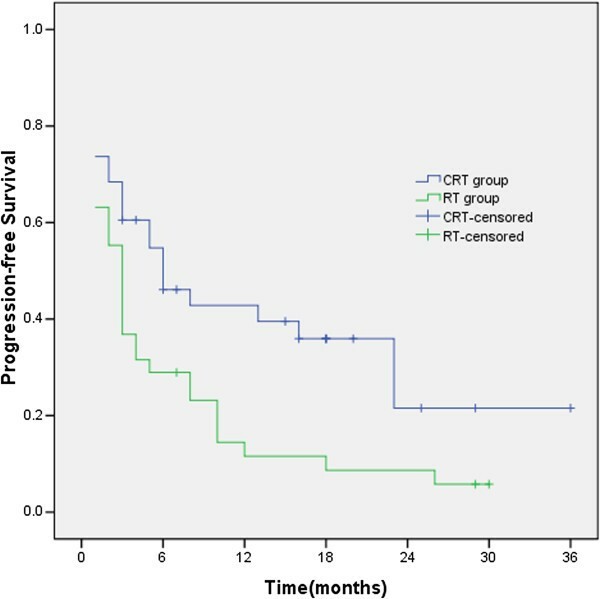 The median survival time (MST), the 1- and 2-year survival rates were 13 months, 50.8% and 37.9% for CRT group and 10 months, 40.4% and 16.50% for RT group (χ2 = 1.811, p = 0.178), respectively. The median intracranial lesion local control time of CRT group had not yet been reached, and the median intracranial lesion local control time of RT group was 11 months. The 1- and 2-year intracranial lesion local control rates were 75.9% and 65.2% for CRT group and 41.6% and 31.2% for RT group. The intracranial lesion control rate of CRT group was significantly longer than that of RT group (χ2 = 3.892, p = 0.049), as shown in Figure 4. 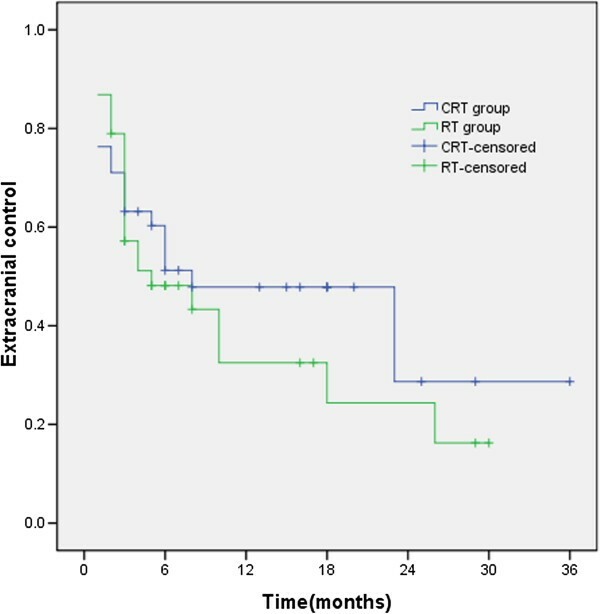 The median intracranial lesion local control time of CRT group had not yet been reached, and that of RT group was 11 months. The 1- and 2-year intracranial lesion local control rates were 75.9% and 65.2% for CRT group and 41.6% and 31.2% for RT group. The median extracranial lesion control times and the 1- and 2-year extracranial lesion control rates of CRT and RT groups were 8 months, 47.8%, and 28.7% and 5 months, 32.5%, and 24.4% (χ2 = 0.610, p = 0.435), respectively. There was no significant difference in the extracranial lesion control rate between the two groups (Figure 5). The 1- and 2-year extracranial lesion control rates of CRT and RT groups were 8 months, 47.8%, and 28.7% and 5 months, 32.5%, and 24.4% (χ 2 = 0.610, p = 0.435), respectively. Among the patients in both groups, there were 17 cases of patients with SCLC in CRT group and 13 cases in RT group. 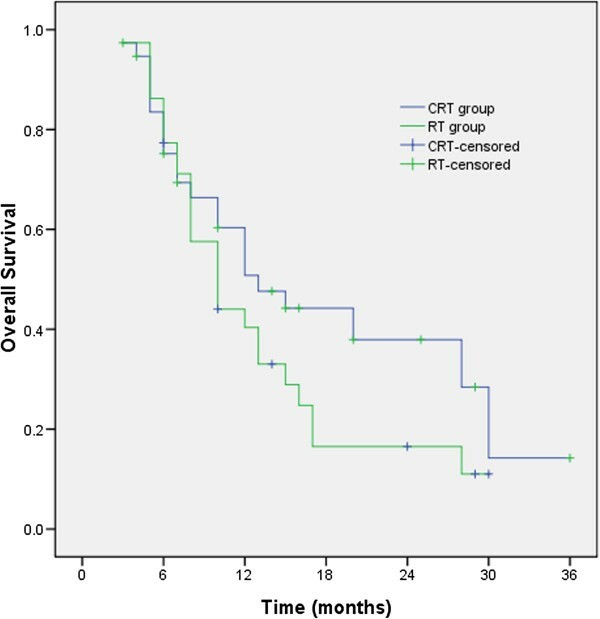 The MST and the 1- and 2-year survival rates of CRT group and RT group were 28 months, 72.7%, 58.2% and 15 months, 63.6%, 27.3% (χ2 = 0.884, p = 0.347), respectively (Figure 6). There were 21 cases of NSCLC in CRT group and 25 cases in RT group. The MST and the 1- and 2-year survival rates of the two groups were 10 months, 33.8%, 16.9% and 8 months, 26.3%, 9.9%, respectively, with no statistically significant difference (χ2 = 0.667, p = 0.414) between the two groups (Figure 7). 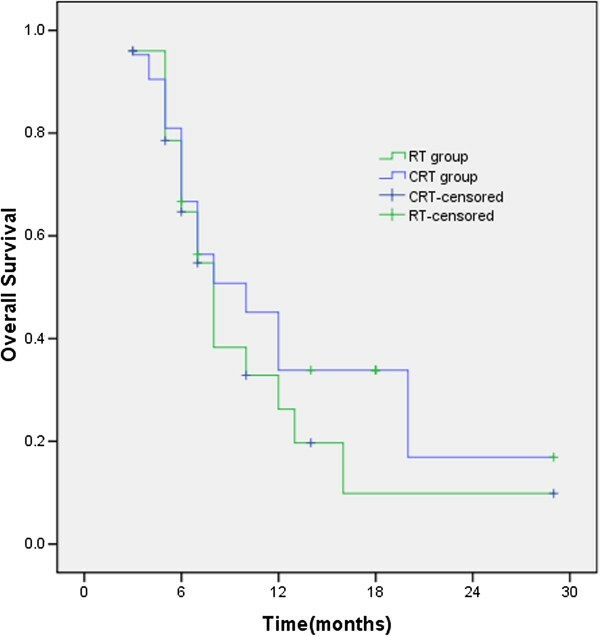 For small cell lung cancer, the MST and the 1- and 2-year survival rates of CRT group and RT group were 28 months, 72.7%, 58.2% and 15 months, 63.6%, 27.3% (χ 2 = 0.884, p = 0.347), respectively. For non-small cell lung cancer, the MST and the 1- and 2-year survival rates of the two groups were 10 months, 33.8%, 16.9% and 8 months, 26.3%, 9.9%, respectively. The side effects in both groups were mainly bone marrow suppression and gastrointestinal toxicities. The incidence of side effects in CRT group was slightly higher than that in RT group. The bone marrow suppression rates in the two groups were 68.42% and 50%, respectively, and gastrointestinal toxicities occurred in 63.15% and 44.73%, respectively. There was no statistically significant difference for either type. The side effects experienced in the two groups were mostly Grade I–II, with a lower incidence of Grade III side effects, and no side effect with degree IV or above occurred (Table 2). Through the last follow-up, 22 patients in CRT group died and 16 survived. The causes of death were as follows: 5 cases died of intracranial recurrence alone, 4 cases died of intracranial recurrence and multiple extracranial metastases, 12 cases died of extracranial metastases alone (including 6 cases of systemic multiple metastases, 4 cases of bone metastases, and 2 cases with liver metastases), and 1 case died as a result of lung tumour recurrence (died of massive haemoptysis). The causes of death in CRT group were mostly extracranial metastases, accounting for 54.5% (12/22). In RT group, 26 cases died and 12 cases survived; 9 cases died of intracranial recurrence alone, 3 cases died of intracranial recurrence and multiple extracranial metastases, 13 cases died of extracranial metastases alone (including 5 cases of systemic multiple metastases, 5 cases of bone metastases, 2 cases of liver metastases, and 1 case of lung metastases), and 1 patient died of massive haemoptysis due to lung tumour recurrence. The causes of death in RT group were mainly extracranial metastases, accounting for 50.0% (13/26). CRT failed to significantly reduce mortality due to extracranial metastasis (χ2 = 0.099, p = 0.753). Whole-brain radiotherapy is currently the standard treatment for brain metastasis from lung cancer and can increase patient survival up to 3–6 months[6, 7]. However, the rate of complete remission is low, with 30–50% of patient deaths caused by uncontrolled and recurrent intracranial lesions[8, 9]. The possible reasons are insufficient dose for local tumour during whole-brain irradiation and the limited utility of chemotherapy in this area due to the blood–brain barrier. Three-dimensional conformal radiotherapy is a newly developed radiation therapy technology that can maximise the radiotherapy dose to tumour but not normal tissues and can increase treatment efficacy. The results of RTOG9508 indicated that, for the patients with 1–3 brain metastases, whole-brain irradiation plus boost precision radiotherapy significantly improved the efficacy and local control rate compared with whole-brain irradiation alone, with 1-year local control rates of 82% and 71%, respectively. Efficacy was even better for patients with a single brain metastasis. Further analysis found that, for patients with localised lesions ≥ 2 cm and ≤ 3 metastases, whole-brain radiotherapy plus localised boost irradiation showed good efficacy. Similarly, Casanova et al. found that whole-brain radiotherapy plus localised boost irradiation achieved good efficacy for patients with 1–3 brain metastases from lung cancer, with a 1-year local control rate of 75.2%. Univariate analysis revealed that the local dose was positively correlated to the survival. Stafinski et al. reported that whole-brain radiotherapy plus boost precision irradiation for brain metastases (no other distant metastasis) from lung cancer had an effective rate of 91%, which was significantly higher than that of the radiotherapy-alone group of 62%. The 2-year local control rate of 51% and the 2-year survival rate of 23% were also significantly higher than those of the whole-brain radiotherapy-alone group. For patients with other concomitant extracranial metastases, whole-brain irradiation plus boost precision radiotherapy only improved local control; it did not affect survival, suggesting the importance of systemic concurrent chemotherapy for controlling extracranial metastases. A previous study found that chemotherapy concurrent with whole-brain irradiation may improve treatment efficacy. Topotecan is a semi-synthetic camptothecin derivative. As an inhibitor of topoisomerase I, topotecan can pass through the blood–brain barrier and exerts a radiosensitising effect, with 33–63% efficacy for brain metastasis tumour[13, 21–23]. Combining whole-brain irradiation with a maximum daily tolerated dose of topotecan at 0.4–1.0 mg/m2/d[14, 15, 24] can improve the local control rate of brain metastases, and patients can tolerate it, with myelosuppression as the main side effects. Hedde et al. applied topotecan combined with whole-brain radiotherapy in patients with brain metastases from lung or breast cancer and achieved a treatment efficacy of 72%. Mirmiran et al. also applied topotecan combined with whole-brain radiation therapy for lung cancer patients with brain metastases with a dose for whole-brain irradiation of 30 Gy/10 times, and the median PFS time of 60 days and the MST of 102 days were not significantly improved compared with the results of previous studies. The possible reason could be insufficient radiotherapy and chemotherapy doses. Therefore, the effect of topotecan combined with concurrent radiation therapy to treat brain metastases from lung cancer has not yet been thoroughly assessed. Whole-brain irradiation plus local conformal boost can improve local tumour control, but there is no conclusive evidence showing that it improves survival. The application of concurrent chemotherapy drugs can treat extracranial lesions and further improve the local control of intracranial lesions. Consequently, whole-brain irradiation plus 3-D conformal boost radiotherapy with concurrent chemotherapy would theoretically improve survival. To our knowledge, there are no reports on whole-brain irradiation plus 3-D conformal boost radiotherapy with concurrent chemotherapy to treat intracranial metastasis from lung cancer. Although the maximum tolerated dose of topotecan had been reported[14, 15, 24], we considered that the maximum tolerated dose for the western population may not be applicable to the Asian population due to physical differences between the populations, and this consideration was also based on our previous study results on concurrent chemotherapy and radiotherapy[25, 26]. Therefore, we conducted a phase I clinical study using whole-brain irradiation plus 3-D conformal boost, combined with weekly topotecan chemotherapy. The patients with brain metastases from lung cancer in this study had ≤ 3 intracranial metastases that were ≥ 2 cm in diameter. We found that the maximum tolerated dose of topotecan for Chinese patients was 1.75 mg/m2/w. Based on this result, we performed this phase II clinical study. Our study met its primary endpoint, which was that concurrent chemoradiotherapy significantly improved PFS for patients with brain metastases from lung cancer. Compared with the radiotherapy-alone group, concurrent conformal radiotherapy significantly improved intracranial lesion control. The 1- and 2-year intracranial lesion local control rates of the concurrent chemoradiotherapy and radiotherapy-alone groups were 75.9% and 65.2% and 41.6% and 31.2% (χ2 = 3.892, p = 0.049), respectively. No difference in overall survival (OS) was found between the two groups, with the possible reason being that CRT failed to significantly reduce extracranial lesion progress. No difference in the extracranial lesion control rate was found between the two groups (χ2 = 0.610, p = 0.435), and the main cause of death in patients in both groups was distant metastasis. Compared with radiotherapy alone, CRT failed to significantly improve OS, the NSCLC in the CRT group obtained an average MST of 10 months and a 1-year OS of 33.8%. These results are comparable with the therapeutic outcomes of whole-brain irradiation combined with concurrent temozolomide (TMZ) chemotherapy and targeted therapy, which produced MSTs of 6.3 and 4.0 months and 1-year OS rates of 20.0% and 37.5%, respectively. The comparable results confirmed the validity of the treatment plan in our research. Our study showed that the application of localised boost irradiation technology and concurrent topotecan chemotherapy achieved better local control of intracranial lesions but did not improve the extracranial lesion control rate. Arrieta et al. reported that whole-brain irradiation with concurrent chemotherapy and chest chemoradiotherapy can be applied to strengthen the control of extracranial lesions for lung cancer patients with brain metastases without metastasis in other organs. In this small retrospective study, the treatment plan provided very good efficacy, with PFS and OS of 8.43 ± 1.5 months and 31.8 ± 15.8 months, and the 1- and 2-year PFS and OS were 39.5% and 24.7% and 71.1% and 60.2%, respectively. The study also confirmed the importance of strong concurrent chemoradiotherapy on extracranial lesions to improve lesion control rate. How to effectively control extracranial lesions is the direction of the future research. The combination of radiotherapy and two-drug chemotherapy should theoretically reduce the possibility of distant metastasis. Tang et al. applied docetaxel and cisplatin concurrent with whole-brain radiation therapy and found that 1-year survival rate of 65% in the concurrent chemoradiotherapy group was significantly higher than the 30% survival rate in the radiotherapy-alone group. In recent years, the targeted drugs gefitinib and erlotinib showed good efficacy in the treatment of NSCLC and some studies showed efficacy for brain metastases from lung cancer[31–34]. In the future, whole-brain irradiation with concurrent targeted therapy could be used to improve the systemic tumour control rate, thereby improving overall survival. In summary, whole-brain irradiation plus conformal boost irradiation with concurrent topotecan chemotherapy for brain metastasis from lung cancer resulted in good PFS and the intracranial lesion control rate, and showed good tolerance. We recommend this treatment plan for a phase III clinical trial to further investigate long-term efficacy. Whole-brain irradiation plus conformal boost combined with two-drug chemotherapy regimen or targeted drug may be a potential treatment plan to improve the efficacy of treatment for brain metastasis from lung cancer. QL, the corresponding author, is the Associate Professor of Department of Oncology, North China Petroleum Bureau General Hospital of Hebei Medical University, 8 Huizhan Avenue, Renqiu City, Hebei Province, P.R.China. He is focusing on the chemoradiotherapy on the thoracic neoplasm. He has found difference tolerance between Asian patients and Western patients when they received concurrent chemoradiotherapy in lung cancer and esophageal carcinoma. 1.Lin Q, Liu Y, Wang N, Huang Y, Ge X, Ren X, Chen X, Hu J, Guo Z, Zhao Y, Asaumi J: A modified Phase I trial of radiation dose escalation in 3D conformal radiation therapy with concurrent vinorelbine and carboplatin chemotherapy for non-small-cell lung cancer. J Radiat Res 2013, 54:126–134. PMID: 29882821. doi: 10.1093/jrr/rrs081. 2. Lin Q, Wang J, Liu Y, Su H, Wang N, Huang Y, Liu CX, Zhang P, Zhao Y, Chen K: High-dose 3-dimensional conformal radiotherapy with concomitant vinorelbine plus carboplatin in patients with non-small cell lung cancer: A feasibility study. Oncol Lett.2011, 2(4):669–674. PMID: 22848247. 3. Ge XH, Zhao WY, Ren XC, Wang YQ, Li ZG, Li YQ, Liu YE, Lin Q*: A Phase I trial of dose escalation of topotecan combined with whole brain radiotherapy for brain metastasis in lung cancer. The Chinese-German Journal of Clinical Oncology 2012, 11(8):449–451. 4. Lin Q, Gao XS, Qiao XY, Zhou ZG, Zhang P, Chen K, Zhao YN, Asaumi J: Phase I trial of escalating-dose cisplatin with 5-fluorouracil and concurrent radiotherapy in Chinese patients with esophageal cancer. Acta Med Okayama. 2008, 62(1):37–44. PMID: 18323870. 5. Lin Q, Gao XS, Qiao XY, Chen K, Wang YD, Zhou ZG. Phase II clinical trial of concurrent chemoradiotherapy (cisplatin plus 5-fluorouracil) for esophageal cancer. Ai Zheng. 2008, 27(10):1077–1081. PMID: 18851788. This work was supported by the Science and Technology Department of Hebei Province, People’s Republic of China (No. 072761711). XG designed the subject and drafted the manuscript. QL guided the subject of design and the manuscript writing. XR participated in the design of the subject and carried out the clinical implementation of the study. YL carried out the clinical implementation of the study. XC participated in its design and carried out the clinical implementation of the study. DW participated in its design and helped to draft the manuscript. YW carried out the clinical implementation of the study. BC helped to draft the manuscript and carried out the clinical implementation of the study. ZL carried out the clinical implementation of the study. ML participated in the design of the subject and helped to draft the manuscript. All authors read and approved the final manuscript.